The AuraVR V2 is available at Rs. 299 in Indian Online Market. The AuraVR Go is launching soon at Rs. 899. The AuraVR Ace will be available at Rs. 2,999. Samsung have already sold more than 5 million of their premium gear vr headsets to the world and we are waiting for vr prices to go down further so that some ordinary people can also have some vr fun. Many companies are coming up with the basic vr headset setup with promising pretty good quality output at low prices. AuraVR is one such initiative with their Go, Pro and Ace vr headsets. Right now there vr headsets are available from as low as 50 dollars to select from some premium brands such as Samsung, but if you are from other countries, you may still want to buy those at much lowr price. 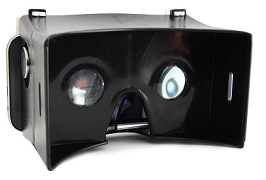 AuraVR recently came up with a new AuraVR Go vr headset model with pricing as low as Rs. 899 in India. It has great interesting features. It can fit with upto 6 Inch display phone and give seriously good immersive experience. AuraVR has a pretty well design with comfortable grip to hold it nicely on your head. There are two sliders on top to adjust lenses and the third slider which help adjust the inner pupillary distance. With these settings, one does not need to wear glasses and still get perfect virturl reality experience. The cheapest is an AuraVR V2 which is a plastic version of Google Cardboard but without paddding and has few sharp edges. AuraVR Pro is the next premium option. It has large plastic unit with foam rubber padding and a premium feel. AuraVR Ace is the costliest among all at Rs. 3000 but isn't a better option than the better prefect Google Daydream View.